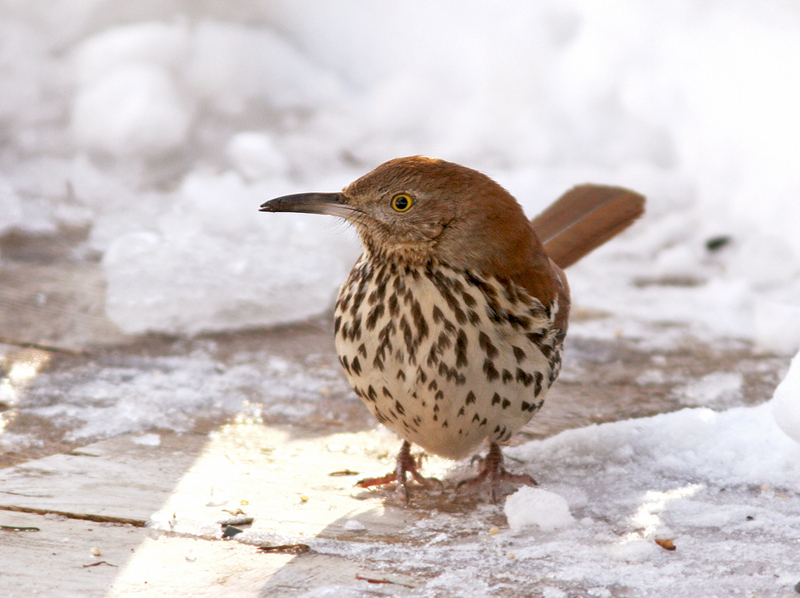 Until my cell phone whistled with an incoming text message from unstoppable birder Alvan Buckley: “Brown Thrasher at the fluvarium. Now.” Three minutes later, with my work sitting idle on the desk and a freshly poured cup of tea still steeping on the counter, I was out the door. Productivity be damned! 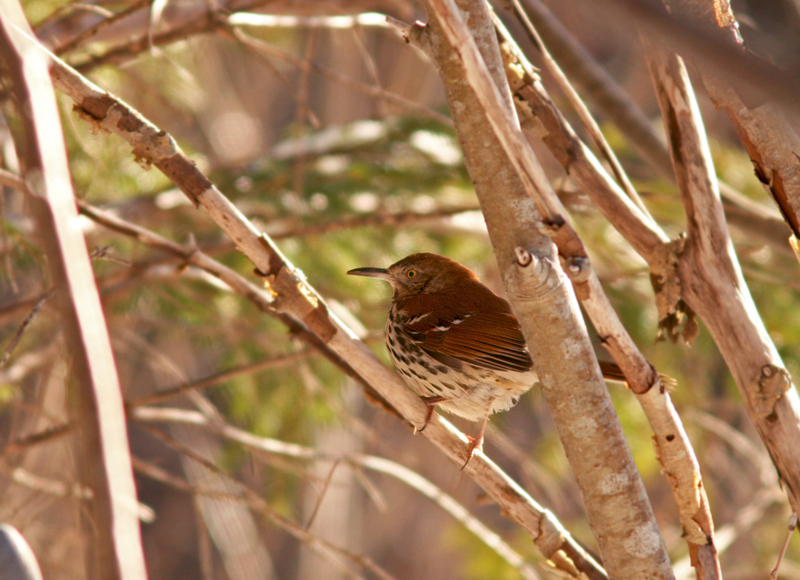 This Brown Thrasher, hanging out at Long Pond in Pippy Park, is a rare visitor to Newfoundland and the first “gettable” one in more than a decade. 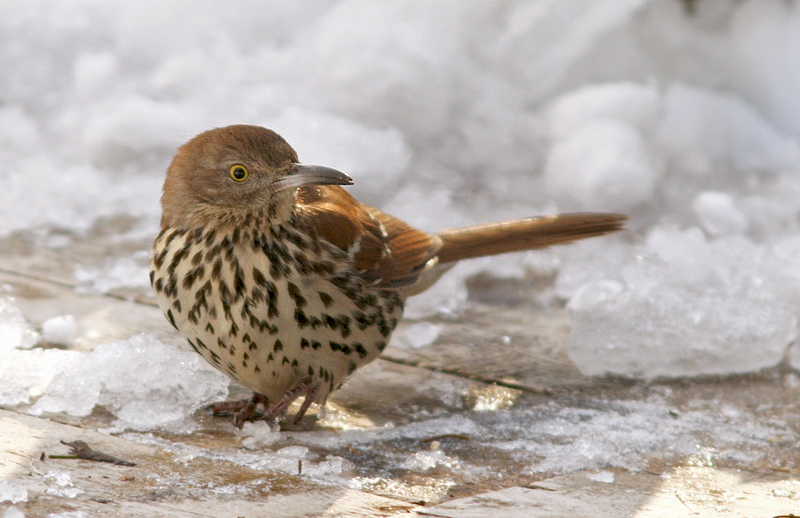 Brown Thrasher is a rare visitor to Newfoundland, with only three or four reports in the last ten years … and it was one I have never managed to see here. Luckily, this one was just five minutes of high-speed driving from my house. I arrived to find a few people milling around on the trail near the fluvarium (at the northeast corner of Long Pond). The bird had been seen a few times but had just flown off. A few more people showed up and we spread out in search of what we knew could be a very elusive bird. Thirty minute later, I saw it flying in over the treetops … it landed briefly alongside the trail before slipping into thick cover and disappearing. Just long enough for an identifying look (tick! ), but certainly not satisfying. On borrowed time, I had to leave with hopes of coming back later. And that I did. After actually accomplishing a little bit of work, I headed back to Long Pond mid-afternoon. Only a few people remained, but they had just located the Thrasher and it was being somewhat cooperative. 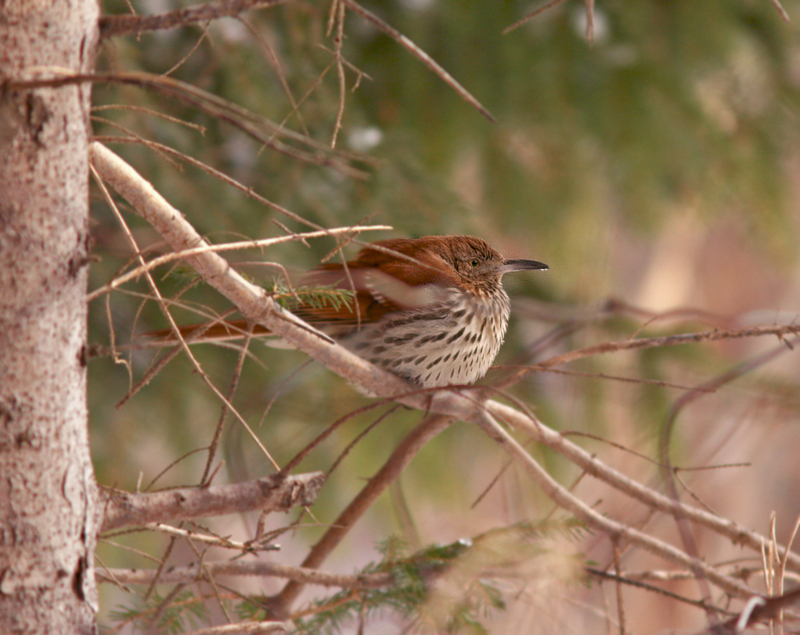 My first looks were typical of this secretive species – sitting in a tangle of limbs and branches. Eventually it flew in to an area of shoveled deck under the fluvarium, where some feeders had been set up and some seed/mealworms scattered … providing close and wonderful looks. The light was pretty difficult for photography, but over the next hour or so I managed to get some mediocre shots as it came and went. According to a staff member at the fluvarium, it has been around (noticed but unidentified) for a few weeks – so maybe it is settled in and I’ll get another chance for better photos! Maybe not romantic, but still a great treat! Susan and I ended the day with an impromptu excursion downtown for a hockey game, some live music and a few relaxing drinks with friends. In my books, that all adds up to a wonderful Valentine’s Day. 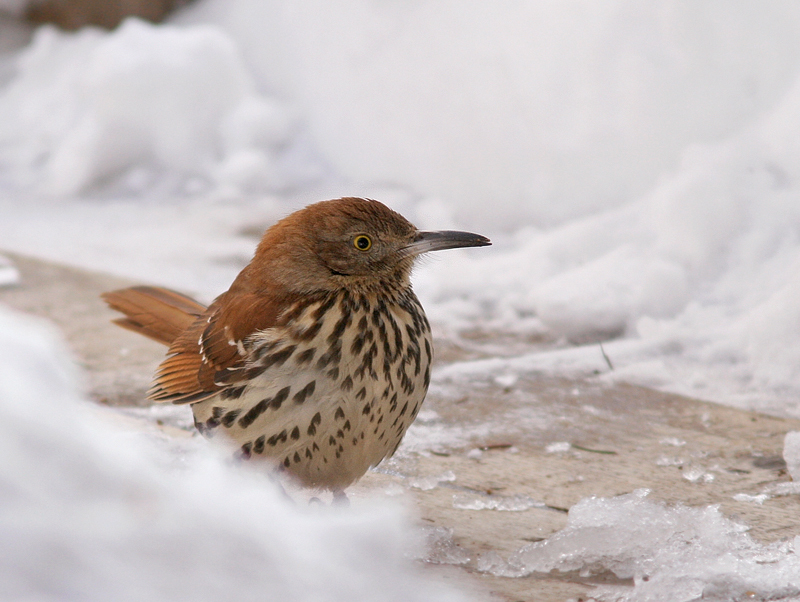 This entry was posted in Photography and tagged birds, Brown Thrasher, Newfoundland, rare bird, St. John's, winter bird list, winter birds. Bookmark the permalink. Nice pictures. No speeding tickets? No tickets this time … thanks to a handful of red lights between me and the bird!